We were walking back from a “power hike” up over the flooded crater called Darwin’s Lake on Isabela Island. The plan was to get back to the pangas for a quick ride around the outer coastline before the captain picked us up with the Evolution for a brief whale watching trip before sunset. We were sort of in a hurry, spread out along the trail. A few meters in front of me, someone looked up and said, “Oh! 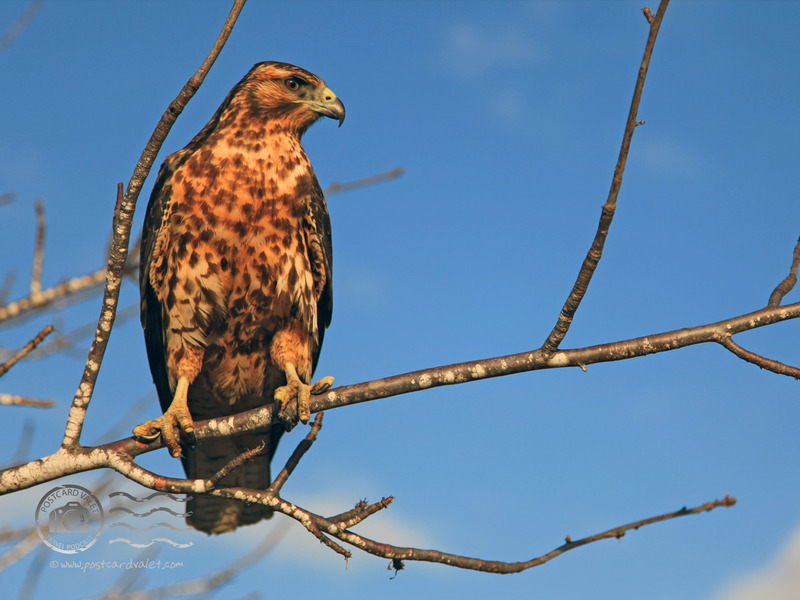 Wow!” There, perched on a branch directly over the trail, was a Galapagos Hawk. He was on the lowest set of branches, low enough that you could reach up and ruffle his feathers. In fact, he was so low, I have no idea how the first few people in our group, including our naturalist guide, managed to miss him! 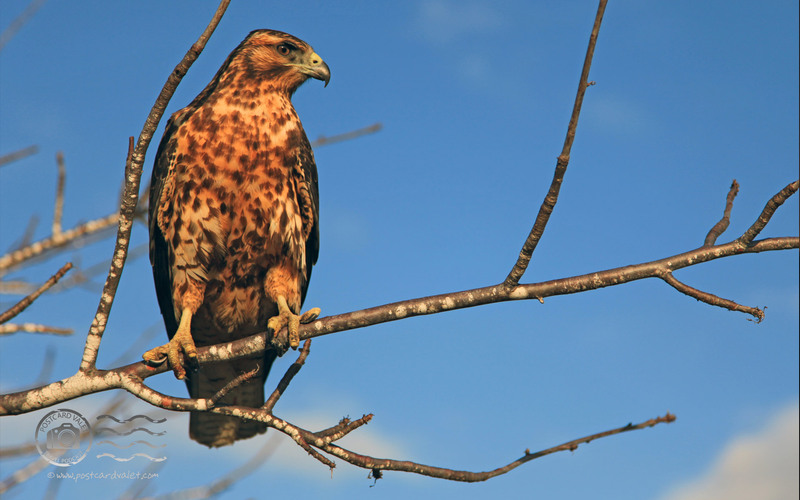 The rest of us, of course, clustered around the hawk and started taking pictures. At first, we moved slowly and stayed a comfortable distance away from him, but then, as it became apparent that he wouldn’t fly away, we stepped closer. Eventually, we were all arrayed almost directly underneath him. If a hawk can be said to have a personality, I would label this one “curious.” As we aimed our lenses at him and clicked away, he peered down at us, rotating his head this way and that. Toward the end of the encounter, I stood directly underneath him with the long barrel of my lens practically up against his talons. He never seemed bothered, never even flinched. I would swear that he was as interested in me as I was in him. When people ask why the Galapagos is so special, I think of moments like this. There’s no other place on the planet where the wildlife are so comfortable around human beings. It’s not just the hawks; it’s the sea lions, the iguanas, the birds, and the tortoises. In the Galapagos, anyone can be a wildlife photographer and some of their best shots will come from a wide-angle lens! Photoshop: Slight crop, Auto color, dodged shadows very slightly, increased saturation very slightly.